Earn up to 2,952 reward points. Rocktron expands the controller universe by adding a floor version of the PatchMate Loop 8. 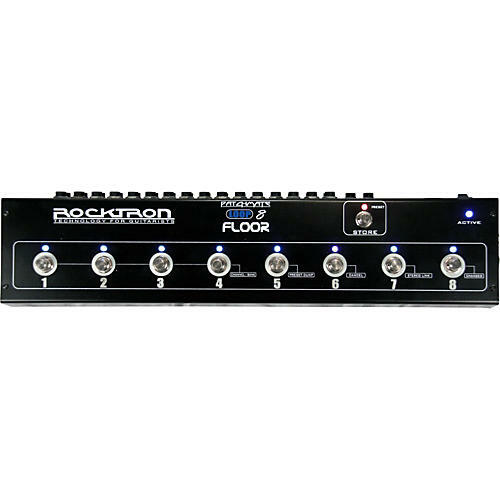 The Rocktron PatchMate Loop 8 guitar floor switcher provides 8 discrete loops all with True Bypass. The PatchMate Loop 8 also delivers both buffered and non-buffered signal paths, and 128 programmable presets with real time control using its 9 high-quality metal foot switches. The 8 loops are configurable for multiple purposes including Channel switching, effects loops, guitar routing and more. The Rocktron stompbox adds preset programmability along with pedal True Bypass to any standard pedal board with ease. The PatchMate Loop 8 Floor is easy to set up and program with real-time user controls. Program the unit from the top panel using the switches. Recall the first eight user presets using the eight onboard footswitches or access a total of 128 presets using external MIDI program changes. External MIDI Continuous Controllers add the ability to trigger loops externally. The Rocktron PatchMate Loop 8 Floor supports intelligent latching and momentary switch sensing, which allows the user to use any MIDI continuous controller number without any other programming effort. The PatchMate Loop 8 Floor has buffered Active and Passive inputs, with passive/active and active outputs on the back. It can be set to any MIDI channel, and is programmable from the top panel as well as configured for use on any of 16 banks of controllers via the top panel switches. The MIDI In/Out/Thru jack makes the Rocktron PatchMate an ideal addition to any floor setup, providing programmable presets, 8 loops with true bypass, real time control, and external loop capability to your pedal board. And as if that weren't enough, by using Rocktron's Smart Controller Technology, the PatchMate Loop 8 Floor switcher works for momentary amplifier switching. Channel switching, effects loops, guitar routing, and more. Order your PatchMate now.